It was with a rather angst ridden conscience that I wrote this review and have dithered about publishing it, which is why it has taken so long to post this, months after the production. I am such a fan of Backstage and all the great work that they do for theatre in Dubai that I am loath to be too critical of what should have been a landmark production for them. I was disappointed with their "Hamlet." There I have said it. The production fell short of what I have come to expect from Backstage. It seems that maybe the teacher has been surpassed by the pupil. I am pretty sure that in the hands of founding member, Gautam Goenka, it could have been a real winner. 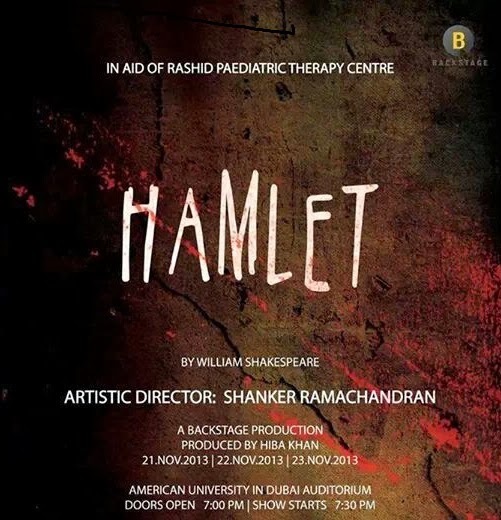 Though it was clear that his mentor, and the show's artistic director, Shanker Ramachandran, put a great deal of thought into how he would stage this show - his interpretation did not work for me. Hamlet is one of the most difficult plays to stage well, and yet remain accessible, and I appreciate how very important it is to cut any play down to a manageable length. I admire that the producer recognised that this had to be done, many don't bother. But, oh my word, it was edited without apparent consideration of what are some of the most memorable aspects of this play, and for me, without enough consideration of Shakespeare’s use of verse. The production lost too much of the language and lyrical quality of Shakespeare’s work in the editing process. Of all plays, editing this one is probably the hardest thing to get right and I certainly would have great qualms about undertaking it myself so I admire the effort. It just missed the mark. It seems to me that too much attention was spent on creating a series of montages and scenes with little or no dialogue. Some scenes were so shortened, that we had actors just miming the action. Why would you do that? Hamlet is after all, supposed to have pretty good dialogue. It is Shakespeare. It contains some of the best lines in the English literary landscape. It also has a brilliant plot. In a nutshell Hamlet (Asad Raza Khan) comes home and finds that his mother "Gertrude" the queen (Brooke Butterworth) has rather too quickly gotten over her husband’s death. Hamlet is riddled with a racking angst filled grief, he has issues with his subtly Oedipal relationship with his mother and a vengeful attitude to his cuckolding uncle "Claudius"(Kris Morton). He is in love with and loved by the beautiful Ophelia (Priyanka Johri) but his complicated relationship with his mother and his overwhelming feelings of disgust at his mother and uncle’s behaviour taints his view of all women and poisons his love for Ophelia. Brilliant stuff right? Poor Ophelia, in her turn is driven to madness as she becomes increasingly confused and torn between her lover's shoddy treatment of her (to put it mildly) and her father's and brother's disapproval of her choice of boyfriend. 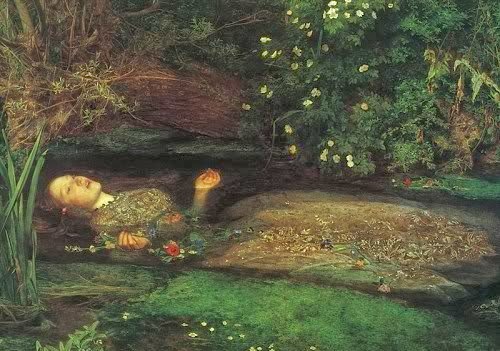 Ultimately this results in her watery poetic death. All this captured not only in Shakespeare’s words but in subsequent artworks of great beauty. Inspirational stuff this Hamlet. Add to the mix the appearance of Hamlet's father's ghost praying on Hamlet's guilt and baying for revenge for his death. Hamlet is in turns wildly mad and frantic, then depressed and introverted, then manic again, wonderful stuff to get your teeth into. There is a bit of light relief in the form of Ophelia father Polonius the "foolish prating knave" whose character has given the English language a few oft used words of wisdom “never a borrower nor a lender be;” ”to thine own self be true” to mention a couple. Missed from this production (understandably) is the rather black humour of the grave diggers. The plot unfolds, skulduggery ensues, and ultimately, following the true form of Shakespeare’s tragedies, anyone who is anyone dies. Dramatically. Casting the lead in Hamlet is a challenge. You need someone who can act well ,naturally, is able to elicit sympathy from the audience and who has a compelling presence on stage that convincingly portrays the depth and scope of this mercurial character. Asad Raza Khan did the very best with the role that he could do, but he lacked enough of the one ingredient that you cannot learn for the stage. Charisma, you either have it or you don’t and you need it by the bucketful for Hamlet. Hani Yakan continues to grow in scope and I thoroughly enjoyed his performance of Laertes. Brook Butterworth can always be trusted to give a fine performance and whilst I felt she was not at her best I particularly enjoyed Act 3 Scene IV and the interaction between Gertrude and Hamlet. The scene in her chambers skittered on the edge of their relationship beautifully. There were good performances by many of the smaller roles too. The overall effect was competent and not at all unwatchable. What distressed me was the treatment of the script and the poor use of a beautifully designed set. To find out what Backstage are doing at the moment click on here for their Facebook page and here for their web site.